Although the Pinelands Cricket Club was established in 1934, on 13 September to be exact – it is interesting to record that at a meeting held on 9 April 1926 of the Board of Directors of Garden Cities, the Housing Association which established the garden city, consideration was given to the construction of a cricket fields on the planned recreation centre. In December of that year a layout was prepared for a sports complex to include hockey fields, croquet courts and cricket and football pitches. Due to a shortage of funds and lack of interest no further action was taken until February 1929 when the earthworks and leveling of the site was undertaken at a cost of £900. This first field is part of the site of The Oval. The records show that throughout 1926 to 1932 various attempts were made to establish a cricket club but these came to nought and those interested joined other clubs in the Cape Peninsula. By 1934 Pinelands had grown to some 600 houses and a group of residents approached Mr Ralph Fox, also a resident of Pinelands, to assist in the formation of a club. He immediately organised a whip around for funds and persuaded all who could in the cricketing world to give practical assistance. 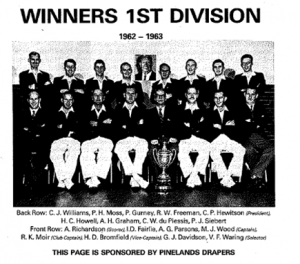 Their efforts were rewarded when at a meeting held in the Pinelands minor hall on 12 September 1934 it was unanimously decided to form the Pinelands Cricket Club with the Founder of Garden Cities, The Honourable Richard Stuttaford, its first patron. Some 34 persons attended this meeting at which Mr Whitford-Griffiths was elected President, Mr Ralph Fox Chairman, Mr J.W.P. Logan, the Estate Manager, as Vice President and Mr H.Q. Davies as the Club’s first Honourary Secretary. At that time Pinelands extended from the Railway station to where the tennis courts are situated today. Central Square did not exist and there where no shops or other amenities. The Club approached garden Cities for the use of the vacant land adjoining the hockey field which at the time used to adjunct to an old brickfield. Garden Cities was sympathetic and hired out the land at a nominal rental of £1 per year and each weekend and free evenings members of the Club came along and cleared the mass of rubble and broken bricks that covered the ground. A gravel pitch was then laid an two friendly teams were run for the rest of the 1934 season. Undaunted by the hard work the Club appealed to garden Cities for more land, for help in the building of a pavilion, estimated to cost £50 and for funds for the further leveling and grassing of the field. Garden Cities readily obliged and levied a rental of £5 per year, a figure which the club indicated was “the maximum it could afford”. In March 1935 the first clubhouse, little bigger that a single garage was officially opened and the Club affiliated to the Western Province Cricket Union with a team in the third and fourth divisions. At a Special General Meeting held on 21 February 1935 the Club adopted colours and considered the question of laying a turf wicket. Working hard for the club in those days was the Secretary Mr H.Q. Davies, a Springbok hurdler who had represented South Africa at the Olympic games and ‘Ray’ Ravenscroft who took over the Secretaryship in 1936. Other included Percy Oram, George Rowe and Ralph Fox who, in 1936, was elected the Clubs first Life Member. Enthusiasm was high and in the same year, 1936, a turf pitch was laid at a cost of £48 under the supervision of Dave Nourse then Coach of the University of Cape Town. Membership grew steadily over the next few years and during the summer of 1939 the clubhouse was enlarged by the addition of a shower, toilet and kitchenette. These extensions were undertaken at a cost of £150 – thanks to a loan of £100 from the Western Province Football association, £30 from the Cricket Club and £20 from the Pinelands Athletics Club all of whom made use of the building. The Club’s letterhead made its first appearance in 1939 with a badge made up of a tree in one corner, a house in another corner and the letters PCC intertwined – there was no doubt that the Club wished to convey that it was situated in South Africa’s first garden city. This badge gave was in 1961 to the present design. The Club attracted a number of well-known persons and one, in particular, Mr Geoff Hannay-Robertson who was elected as a Vice President. ‘Uncle Geoff’, as he was known in South Africa and throughout the cricketing world, belonged to every club in the country as well as many hundreds in the far-flung Empire. He never missed an Annual General Meeting of the Pinelands Cricket Club and was always called upon to say a few words Others were the Honourable J.H. Hofmeyer who became the a patron of the Club and Mr Phil Hewitson who took over the Chairmanship in 1939 and was a keen player and an ardent worker for the Club. By now the Club had a third team and the Pinealnds First Team was admitted to the Second Division. Well-known members of that team still associated with the Club are Viv Waring and Norman Cooke. During the war period 1940-1944 membership was sorely depleted and the Club could only field one team in the third division. In 1945 the Club was resuscitated and by the 1967/7 season it bounded back to its three teams – one in the second division, one in the third and one in the fourth with the second division ending as runners up in 1947. Norman Cooke had now taken over the secretaryship and the lower filed had in the meantime constructed with a gravel wicket by Garden Cities, Membership totaled 46 of which 7 lived outside the garden city. In 1947 it held its first annual dinner at the Cogill’s Hotel in Wynberg when some 60 members joined in the fun. A turning point was reached in 1947 when the second division team , captained by Clifford Lee, won the League. This inspired the Club to apply for first division status which was rejected by the Western Province Cricket Union. 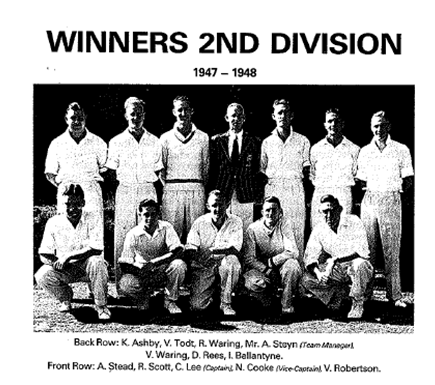 A further attempt was made in 1948 but, alas, with the same result although the second division team again finished as runners-up and our application was strongly supported by the Union’s Treasurer, Keith Ledingham, and ‘Bochels’ Mathews two prominent members of the Union committee. Undaunted a small subcommittee was appointed in February 1949 prior to the commencement of the season to press for senior, or first division status and, after much hard work, the Pinelands Cricket Club was unanimously admitted to the first division at the Western Province Cricket Union meeting held on 2 September 1949 under the Chairmanship of Mr ‘Sport’ Pienaar. The application was strongly supported by the late Jack Cheetham, Keith Ledingham, and ‘Bochels’ Mathews with Ronnie Gardener being the Club’s representative at the meeting. Many Members still with us today, including the Author, will remember the anxious moments and telephone calles made during the course of the meeting and the jubilation which took place when the news came through. Admission to the first division many added new responsibilities and the first of these was the provision of sight-screens. The Club had no funds and Selwyn Myers, who was then captain of the junior teams and garden Cities’ Engineer, designed the first of the ‘hanging’ type of screens at a cost of £42. These were to last only for five years until funds would allow their replacement. Some 32 years later the new sight screens were erected! In 1950 Phil Hewitson was elected President and later that year a Ladies’ Committee was formed to assist in fund raising and Mrs F. MacGowan and Mrs W.L. Robertson being the prime movers. A serious attempt was made during the period to form an umbrella body to cater for all sports in Pinelands but the proposal did not receive the support of all clubs. However, a Board of Control was formed to manage the Oval but this body lasted only some 4 years. Arthur Pelteret joined the Club in 1950 as a player and in the following year was elected to the Committee – a position he retained until his death in 1984. Arthur not only represented the Club as its delegate to the Union and served on a number subcommittees but took on the mantle of scorer and groundsman for the Club – task he carried out with love and dedication. The Club was able to maintain its playing strength in the various competitions and after a vist to South Africa by an English ladies team a ladies section was formed in the 1952/53 season with Christine bald, Nora Williams and Winnie Jeffrey being the leading members. That season also heralded the Club’s first representative player in the person of Ian Ballantyne who was elected to go on tour with the Currie Cup Team. In 1954 the club entered seven teams in the Union’s competitions – the highest number ever by which time it had 97 playing members, 60 non-playing members and 13 lady members and was compelled to increase the subs for seniors to R 8.00. The Constitution was amended to provide for a ladies Representative on the committee but due to lack of support the ladies section dwindled to some 6 members and in 1957 and combined with the UCT Club. The press-box and scoreboard was erected in 1954 at a cost, of £110 thanks to a further donation by Garden Cities, which building has served the Club ever since. On the death of the Honourable J.H. Hofmeyr, Mr Frank Gardener became patron and on his death in 1960 the Chairman of Garden Cities, the late Mr Den Stuttaford, was made patron of the Club — a position he held until his death In 1978. Harry Bromfield was the second Club member selected for Provincial duty — he played from 1957 to 1962 when in the latter year he was selected for South Africa. He played in nine tests ending up with a batting average of 11.8 and bowling average of 35.23. Another milestone was the appointment in 1958 of the Club’s first professional. Jimmy Gray, a fine and popular player from Hampshire. Under his guidance the first team finished fourth in the 1st division and the junior teams also improved beyond recognition. In 1959 the Club undertook its first tour to the Eastern Province which was a great success considering that the team won all but one game. The facilities at the clubhouse were totally inadequate and, in fact, an embarrassment to our members and in the same year a committee was formed under the chairmanship of Selwyn Myers to design and build a new clubhouse and pavilion. Members of the Club wholeheartedly supported this effort by organising many functions, raffles, cake sales and other events and within a comparatively short time a sum of £2 800 had been raised including an amount of £300 from the Pinelands Athletic Club. After nearly a year’s delay in obtaining a lease of the site from the Pinelands Municipality plans were approved for a building to cost £7 500. Once again the Club appealed to Garden Cities for financial assistance and thanks to the efforts of the Club’s patron, Mr Den Stuttaford, and Mr Ted Pettit, who were Chairman and General Manager of Garden Cities respectively, the Company donated the remaining £5 000 and work commenced almost immediately. The first committee meeting was held in the new Pavilion on 12 June 1961 and the official opening by the late Mr Sandy Bairnsfather Cloete took place in October 1961. It has served us well since then but once again the Committee’s thoughts are being turned to further development. At Provincial level many members have contributed to the administrative affairs of the Union. Sandy Moir was our first Selector and Provincial team manager, Arthur Pelteret served for many years on the Grounds and Local Competition Committees, Harry Howell as Umpire and Selwyn Myers as Union Treasurer and President and currently a member of the SA Cricket Union Board of Control. Apart from those already mentioned, Harry Howell, Deon Hugo, Ian Payne and Johnny Bruce played for Western Province while they were members of the Club. During the 1962/63 season the Club achieved its greatest cricketing success when it won the 1st division competition — a feat so far not repeated. Led by Mike Wood they scored some remarkable and exciting outright victories and the outcome of the competition was only decided on the last day of the season. The Club was now well established and on many occasions entertained overseas visiting teams. Finance was always a problem and in 1966 fees had to be increased, this time to R16,60. The Club suffered a serious loss with the passing of Phil Hewitson in 1967 who, together with his family contributed significantly to the progress of the Club. He was succeeded by Selwyn Myers and Sandy Moir became Chairman. There was also a change of Secretaryship when John Smuts took over from John Gurney. In 1972 the Club again moved the practice nets which over the years had been sited at every corner of the fields. Concrete practice wickets were erected in 1949 and as they were the first in the Province they aroused considerable interest. The ripple effects of South Africa’s isolation in the world of cricket touched the Club in 1975 when certain players affiliated to SACBOC, applied to join the Club. After some misgivings in certain quarters concerning the legality of the situation the applications were deferred but in the following year Jock Mahoney and Lawton Jacobs joined the Club to be followed by many other talented cricketers. Cricket in general with other sports in the Western Province was not maintaining its appeal and Club membership at times could barely sustain its team commitments. To overcome these difficulties amalgamation talks were held with neighbouring clubs at various times right until 1983 but in the end the majority opted for going it alone. In the meantime Sandy Moir had retired as Chairman and Mr John Gurney took over in 1974 and he, in turn, was succeeded by James Kift in 1976. By that year the number of teams entered in the various competitions had been reduced to five and as with all other cricket clubs the cost of ground maintenance and equipment was and is a serious problem. At various times the use of a third ground was only possible due to the generosity of the primary and high schools and the Municipality. John Smuts was elected to the Presidency in 1979 and Geoff Pike was elected Chairman. Geoff approached his task in a businesslike and innovative manner making many improvements – including the permanent sightscreens. For many years the Club enjoyed the active support of A.B. ‘John’ Reid a former Provincial player and Selector. He was a great worker for the Club with a flair for detail and his contribution as a Committee Member and Selector was invaluable. In 1982 the Pinelands Municipality took an active part in encouraging the Cricket Club to merge with the Pinelands Hockey Club. The oval was enlarged to accommodate 2 hockey fields, and in the process the cinder athletic track was grassed. After numerous negotiations the amalgamation was announced and the two clubs joined forces to form the Pinelands Sports Club on 1st April 1984. Tony Murray who had taken over as chairman of the Cricket club in 1983 became Chairman of the combined club and Guy Kingwill succeeded him as cricket section chairman. Of course the success of the club cannot only be measured by the achievements of its first team. All players have contributed to the strength of the club, and much enjoyable and successful cricket has been played in the lower leagues. Enter your email address to subscribe to this site and receive notifications of new news by email.